I’m going to try my best this week to bring you some books that capture America’s social situation. What does that mean? I’m not sure, but let’s read together this week. Here’s a powerful title to end my social situation week…whatever that means. This one is tough for me. A product of a military parent that had an American government funded alcohol addiction started in Vietnam when he was underage, I have a lot to say about the way veterans are treated in this country. We all do, right? Our military is a hot button issue. We all feel some sort of way about the troops, and the recent NFL kneeling situation created an even bigger social divide on the issue. Veterans’ Day was this weekend, and per usual, I got to thinking about my dad, and how messed up he was due to his stint in Vietnam. I don’t think I ever knew who he really was because the man that I grew up with had issues, and those issues were allowed to fester and grow in a society that supported ideas about men that made it OK to look down upon admitting the need for help. And these issues still exist. 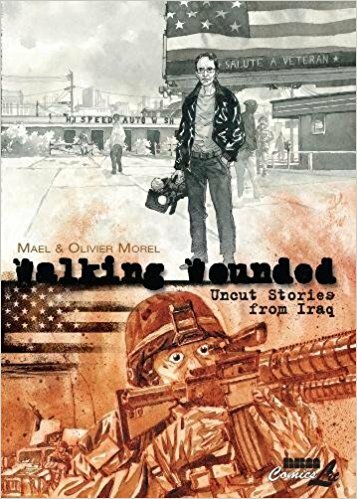 So, while reading Walking Wounded, Olivier Morel’s graphic novel about getting close to survivors of the Iraq War while creating a film documentary, I can’t help but to see my father in many of the survivors in the book. It’s easy for us to say “support the troops,” like “thoughts and prayers” rolls off the tongue after a societal travesty. It’s something we say, most of the the time out of nicety: a phrase, like many others with no real implication. I saw first-hand how my dad was treated at veteran medical facilities, and while most of the staff at these locations were doing their best, funding for our veterans was lacking, especially in the area of mental health. We can and must do better for our troops. Maybe, just maybe, we stop caring as much about who stands or not at a football game, and direct our attentions to improving real veteran programs. Hell, people kneeling at a football game has nothing to do with our military anyway. And no, I do not mean that we shouldn’t say “support out troops.” We should. I just believe that this in one of those instances where actions speak louder than words. Donate to your local/national veteran support groups, and promote candidates/legislation that will work to help our troops and their programs during and after duty. Right now, you can visit the Wounded Warrior Project here to donate and get involved. 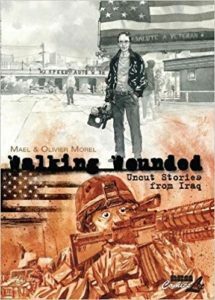 There are quite a few really well-done non-fiction graphic novels about war. I will try to feature them in the weeks to come.